Super Bowl XLIX is around the corner and this time it is between Seattle Seahawks and New England Patriots. So I decided to make Pom Pom beanies with Team colors of these two teams using my original pattern here with some minor changes. I switched the colors randomly this time creating a new color sequence for each beanie . Also I added a knit look band to finish off the beanie . Follow the original pattern up to row 11. Round 12: Hdc in the 3rd loop of the next stitch all around. Round 13: Repeat Row 12. Round 14: Sc in the 3rd loop all around and finish off. Cut 6" tail and weave in the end. 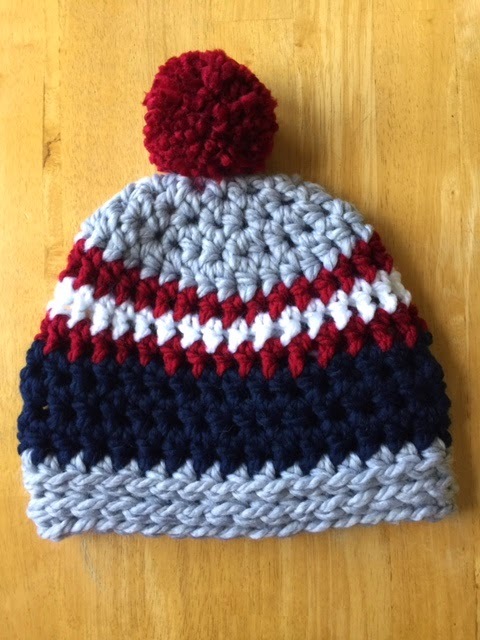 Half double Crochet in the 3rd loop gives a knit look finish to the hat. There is a very nice tutorial and a video here which tells you how to look for the 3rd loop behind the next stitch. Please do not reproduce any of these pattern or distribute them and claim them as your own. If you want to make items to sell from my patterns, Please credit me with the design, and link back here .